When planning an office move many companies rely on the services of a commercial moving expert to help minimize costs and business interruptions. Fitzgerald Moving & Storage brings more than 35 years of experience to every project that includes creating a custom office moving plan that accounts for every detail and keeps your commercial move on schedule. Every piece of furniture, file cabinet, computer and fixtures, arrives at your new location on time and in perfect condition. However, we know that not every commercial moving project takes place in just one day. 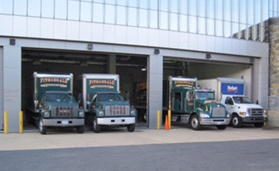 When clients are faced with a move-in delay, they count on Fitzgerald for clean and secure storage solutions. With more than 500,000 square-feet of available space we provide state-of-the-art storage for short-term or long-term needs. Your office furniture and equipment will be secure and ready when you need it. As an added benefit, we also provide clients the option of Certified Records Destruction. This specialized service ensures sensitive and highly confidential documents and data are properly destroyed and disposed of as part of the office moving plan. This prevents this material from falling into the wrong hands. To learn how we put our commercial moving and office relocation experience to work for you Contact Us to discuss the specific requirements of moving your office or commercial space. Fitzgerald Moving & Storage uses our knowledge and experience to execute stress-free commercial moves that stay on schedule and on budget. In 2016 and 2017, Fitzgerald Moving & Storage was voted 'Best in Industry' for Moving & Storage by CREBA.org.